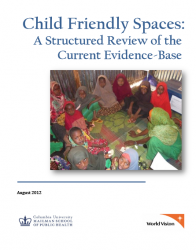 Starting in 2012, Columbia University, in collaboration with World Vision International, has worked to assess the protective and restorative effectiveness of Child Friendly Spaces (CFSs), identify good practice in their design and implementation, and contribute to the development of better monitoring and evaluation tools for programming. This project is an ongoing series of program evaluations that have been conducted within refugee populations in Ethiopia, Uganda, Democratic Republic of Congo, Iraq, and Jordan. Since the initial studies, the project has evolved into a multi-agency collaboration to ensure research findings and implications benefit the broader humanitarian community, notably through the Child Protection Working Group of the Global Protection Cluster. The initial project partners have been joined by several implementing and supporting agencies such as UNICEF, Save the Children, Mercy Corps and AVSI.